Firstly, I do not agree with the title of this song. But, each to their own I guess. 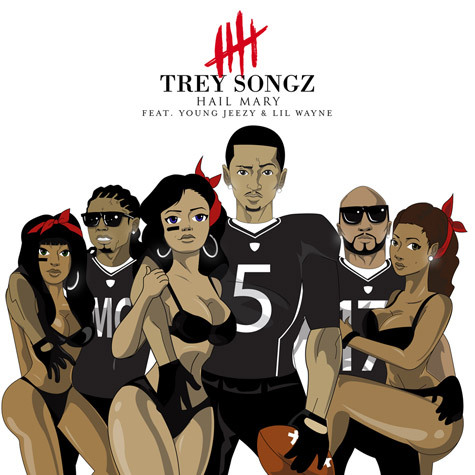 Trey Songz whose 5th studio album Chapter V dropped yesterday has released the official comical video to 'Hail Mary'. The single which features Young Jeezy and Lil' Wayne, features Kevin Hart in the new video - LOL! With an all-female-American football squad, Trey Songz and Kevin Hart both play the role of being coaches to these women. Of course Kevin Hart brings his hilarious self to this music video. Cameo appearances from Love and Hip Hop Atlanta's Joseline Hernandez and Stevie J! Chapter V in stores today!